Poised to open in 2013, The National Art Gallery, Singapore (TNAGS) aims to provide a regional and cultural framework with a strong Southeast Asian focus, most importantly it will showcase Singapore’s heritage to local and international audiences. The National Gallery Open House celebrations in October 2010 officially launched the plans for this project to the public and featured special guided tours, film screenings, workshops, talks, a photography exhibition, bazaars and a dazzling façade lighting display. 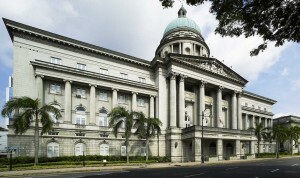 Following this event, the majestic colonial structure, formerly the City Hall and Supreme Court was shut down for renovations and restorations to be renewed as the National Art Gallery of Singapore in two years. Mr. Kwok Kian Chow, Director of TNAGS, explains the necessity for the new space and how this new museum will set itself apart from its sister institutions such as the National Museum and Asian Civilizations Museum. “There is a need to look at Southeast Asian art history in a broader field of social and cultural knowledge. The scope and definition of “art” in Southeast Asia has to be considered from within a much broader social field.” The National Art gallery is slated as “the new art institution which will contribute towards building Singapore as a regional and international hub for visual arts...” Herein lies the key to the identity of this new museum where the approach to collecting, curating, representation and programming are predicated on the exploration of cultural relations both within and beyond Southeast Asia. The other museums cover different areas of focus; The National Museum spotlights Singapore’s history and culture while the Asian Civilizations Museum provides a broad yet integrated perspective on pan Asian cultures and civilizations. However, Mr. Kwok admits that “the greatest challenge of TNAGS is going to be the facilitating of art historical scholarship especially in view of the relative lack of analyses within Southeast Asia and intra-Asian studies when compared to western art history.” The National Art Gallery will therefore play a crucial role in the international scholarship on Southeast Asian art history and will facilitate research on the social and political history as well as the re-evaluation of art historical categories and their roles in the Southeast Asian context. “Looking at Southeast Asia, there is no escaping from the subjectivity of Singapore. On the other hand, the regional outlook of this city, as reflected in our art history in topics such as the Nanyang School, figures inextricably in the museum’s role as a facilitator of Southeast Asian Art History. We are therefore, using art to think about SE Asia and revive the “community” of SE Asians.” In fact, the Gallery will dedicate a floor to interactive workshops and activities especially to engage younger audiences and plans are also being developed local and international artists to experiment with their space. Bharti Lalwani has an MA in Contemporary Art and writes for publications such as Asian Art News and www.arterimalaysia.com, curates on occasion and is currently developing art education approaches for children under 10 years of age.